I’m setting myself a small resolution in the form of reading more often, at the charity shop I volunteer at I noticed a box full to the brim of paperbacks that had not yet been sorted. My eyes were fixated, I always enjoy sorting through the books that have been donated as it’s interesting to see what people have been reading (Fifty Shades of Grey has already proven a popular donation). I instantly spied The Hand That First Held Mine, a book I have been wanting to read for so long now. I then discovered Eat Pray Love, a book my best friend has highly recommended to me. All books cost just 50p or there's the choice of purchasing three for £1.00 (multi-buys can also be found in charity shops). Right at the bottom of the box I found a modern classic in The Time Traveler's Wife, I borrowed a copy a few years ago, but only got a third of the way through and never went back to it, I think this one certainly deserves a second chance. 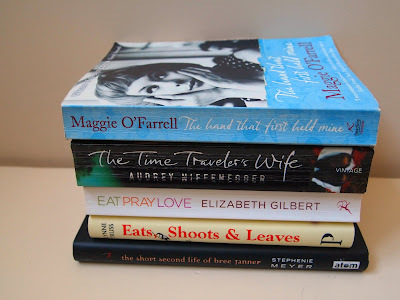 The bottom two books - Eat Shoots & Leaves (£2.75) and The Short Second Life of Bree Tanner (50p) were also bought second-hand, and have been on my to read list for a while. This pile should keep me occupied especially on these cold winter nights throughout January. I gave up on 'Eat Pray Love' in the end! I loved the first part in Italy, but lost interest when it got to the pray part! And I have always wanted to read the Time Travellers Wife! I read her second book 'Her Fearful Symmetry' after finding out it was based in London's Highgate Cemetery. I totally loved it and kept meaning to blog about it at the time! I really really don't fancy Eat Pray Love, but I've read all the others. I love Maggie O'Farrell, but I preferred her earlier ones. Snap on the resolutions front! I loved the Time Traveller's Wife - it's a fantastic book, hope you enjoy it! Reading more is on my to-do list this year too! Will definitely make an effort to check out the book section in charity shops!